Here’s a story of one Friday night when I had two firsts. Both of them are sweet, both of them are yummy, and both of them are a bit tad expensive but all worth it. 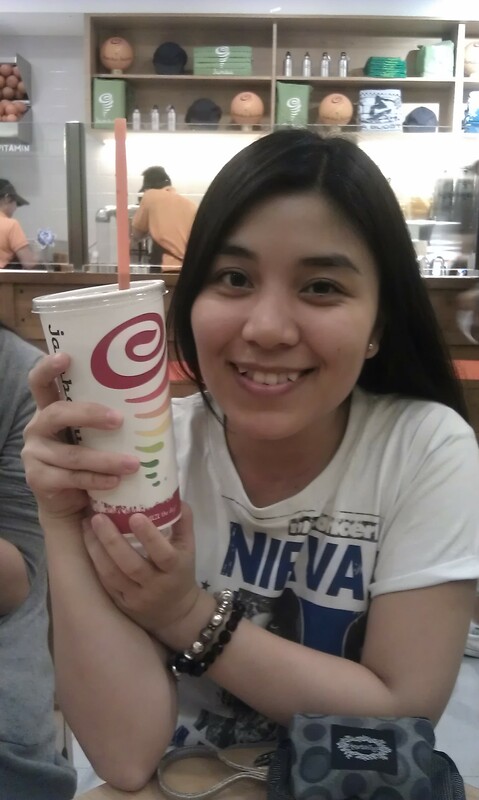 Up until the moment when Ying asked as out to go to Bonifacio High Street (in the middle of our shifts) and get ourselves some Jamba Juice, I only have a faint idea of what it is. I’ve read a number of tweets and Facebook posts about it but I never bothered to check. 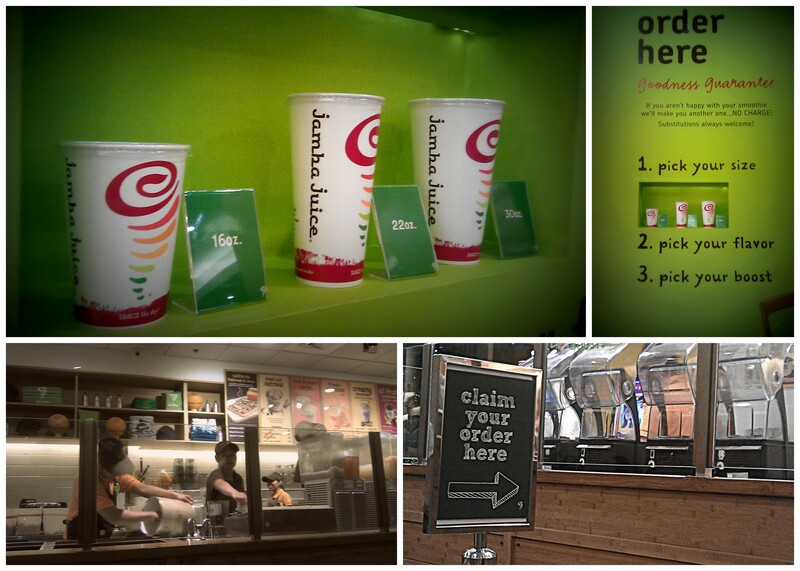 When I first stepped into their store, my first thought was it was like Starbucks but serves shakes, parfaits, and other fruit concoctions instead of coffee and tea. The store is crowded when we got there, with chairs strewn here and there to accommodate odd number of groupies that are having their fix. It got noisy at times; the store music could not override the overall chatter of the crowd. If you want some peace and quiet, sit outside. I ordered the medium-sized Peanut Butter Moo’d. It’s a perfect mix of yogurt, soy milk, and peanuts. I tried to Google it to check the exact ingredients and was surprised to know that it has banana in it. I honestly cannot remember it when I ordered. Anyway, it tastes really good, but I’m not really shake crazy so it got to a point where I just have to sip through it. It would have been better if I ordered the small size. Note to self: Check the ounces of your drink size before you order. 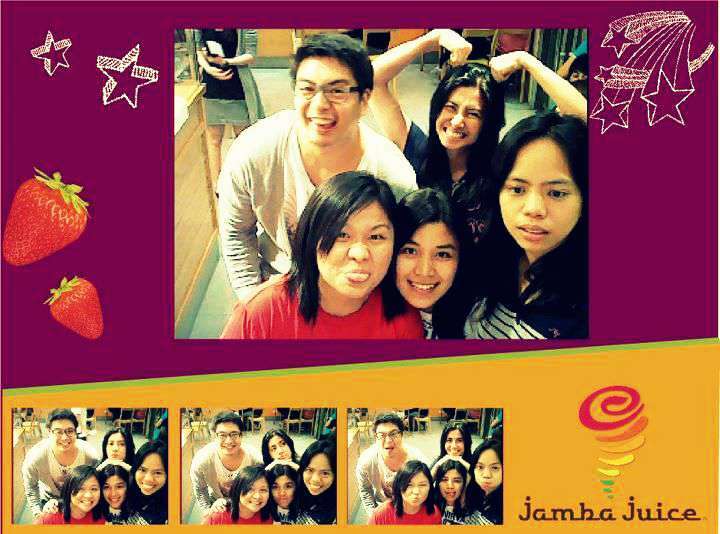 What probably makes it original from all the other refreshments stores is the photo booth where you and your friends can take pictures and instantly upload them to their Facebook page. You can also send them directly to your email account. A good advertising scheme, I must say. Here we are, trolling around and not minding the other people who are in line. Hehe. 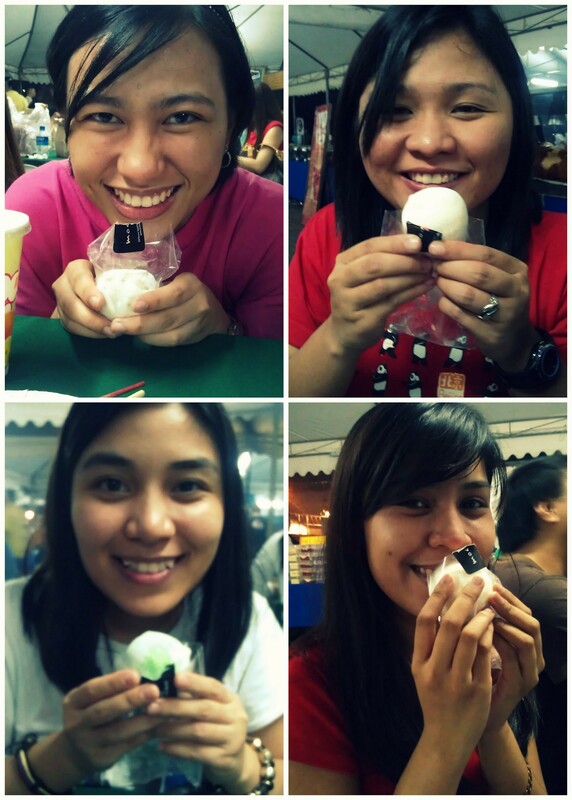 After work, we headed over to Mercato Centrale. For those who don’t know, Mercato is this midnight market that sells a variety of food choices — barbecues, kebabs, cakes, shakes, burgers, frankfurters, you name it. I went there to have my usual barbecued chicken liver, but we discovered something else. Mochis! 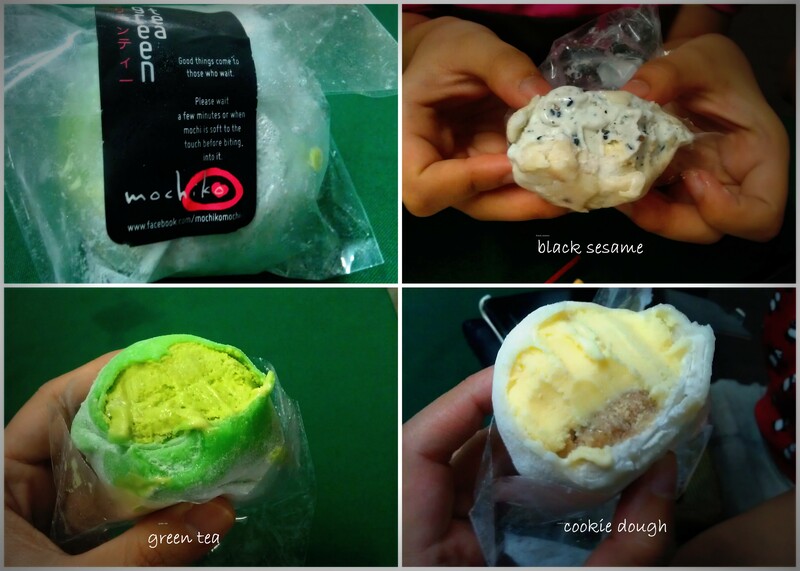 My only close encounter with mochis is during my yogurt-crazy days when I have to choose the toppings. I haven’t tried mochi on them because I thought it’s one of those disgusting, exotic food that you get from Chinese stores. I was wrong! For one, mochi is a Japanese rice cake from Japan, and two, it is not exotic and disgusting at all! I think the best part of eating them with ice cream inside is the anticipation. Mochiko printed a cliche line in the cover which says, “Good things come to those who wait”. Since the mochis were frozen (because of the ice cream inside), we have to wait for a few minutes for it to be soft. They were not kidding. We were in for a good surprise! 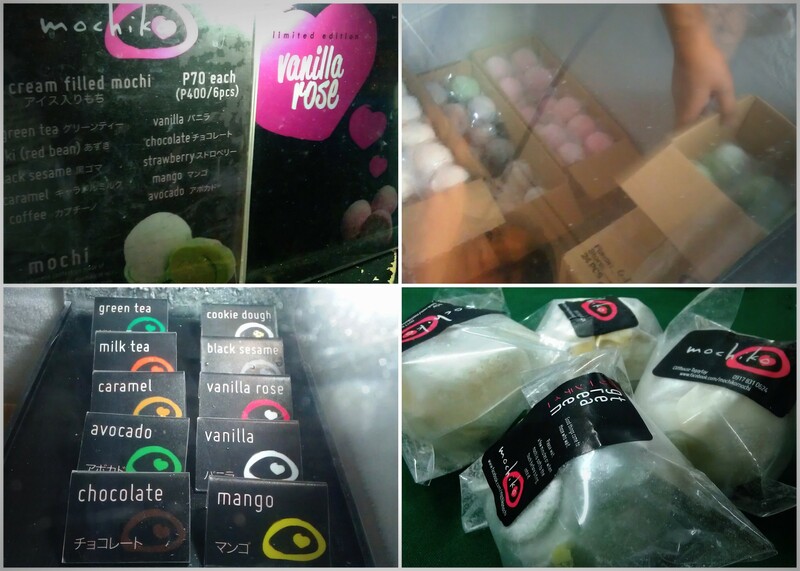 Enjoying our variously flavored mochis! I remembered that “one pound of fat comment”. Well, excuuuuse us for living.